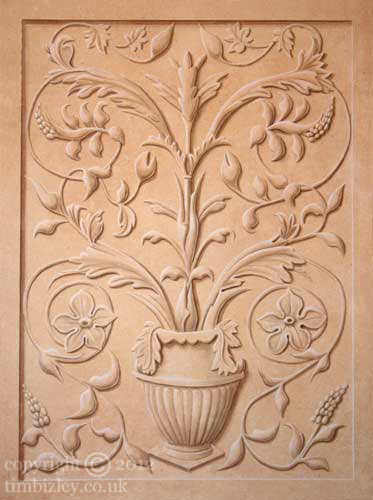 This bas relief faux stone mural panel with its rendition of carved stone exhibits tones which illicit feelings of warmth. The technique can add focal points and interest when incorporated into stone blocking schemes, which emulate large areas of dressed stone, or be used as discovered pieces in plain walls or painted hung as antiquities. The light tonal palette enables complex designs to be created without an undue sense of heaviness. The grisaille mural and monochrome trompe l'oeil ornament have a long and effective tradition of use in interior design. The colours of the radically restricted grisaille palette can be modified into areas of coolness or warmth or a colour chosen to harmonize with extant elements in architecture or design schemes. Commissioning a mural from a muralist is similar to commissioning a painting and a good muralist will be able to offer design advice and guidance for the project.